I certainly do! 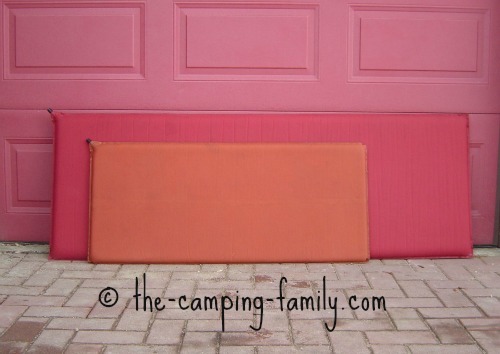 I've camped on a Thermarest air mattress for many years, and I highly recommend them. These self-inflating sleeping pads are extremely comfortable for sleeping. This is my camping sleeping pad of choice. I’ve slept on air mattresses, full sized air beds, camping cots and foam pads, and I prefer a Thermarest to all of those for many reasons. 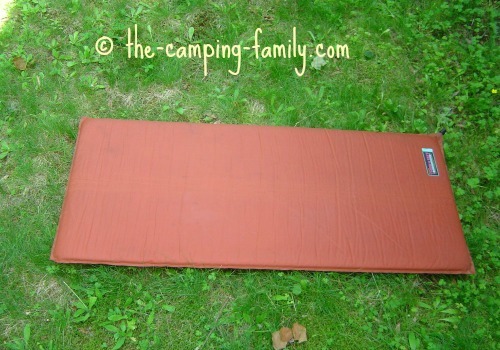 What is a Thermarest sleeping pad? It's the oldest and most well known brand of self-inflating sleeping pad, made by a company called Cascade Designs. These days there are a number of other makers of foam-filled self-inflating pads, but Thermarest remains the industry standard. 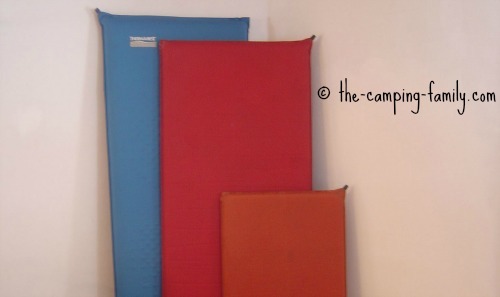 To learn more about self-inflating sleeping pads, click here. Of all the sleeping pad options, I think that Thermarests are the most comfortable - even more so than a full sized air mattress! I'm not exaggerating when I say that I sleep as well on my Thermarest sleeping pad as I do in my comfortable bed! Do you have a smaller tent? You won’t have room for large cots, or a big air bed - but you’ll have plenty of room for Thermarests. Here's our tent, with four comfortable Thermarest air mattresses side by side. It is easy to pack. Are you car camping? 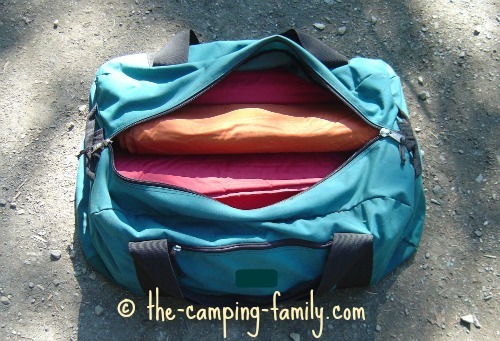 You can fit the Thermarests for the whole family into a large duffle bag. Backpacking? Your Thermarest will fit inside your backpack - or you can strap it to the outside. I’ve had my first Thermarest air mattress for more than 20 years. My husband has had his for almost 30! We have used them lots, and they are both still in excellent condition. We’ve never had a puncture - but if we did, it would easily be repaired. Read about Thermarest repair here. When I bought my first Thermarest, there were just two choices: short and long. Now, there is a wide variety of options. Here are just a few of the current offerings. The Thermarest NeoAir XLite is the most packable Thermarest ever. When fully collapsed, it is the size of a 1 litre water bottle! The smallest model weighs only 8 ounces/230 grams! The Thermarest ProLite is perhaps more comfortable than the NeoAir, but no heavier and only a bit bulkier. The Trail Lite is a good all-purpose mattress. It's light enough for backpacking (1 lb 12 oz/800 g) but is comfortable and durable enough for car camping. I have a Base Camp mattress, and I love it. It's too bulky for backpacking, but perfect for car camping. Or if you want absolutely over-the-top luxuriousness, check out the NeoAir Dream or the MondoKing! I bought this almost 20 years ago, when I first became interested in backpacking. In those days, when there were only a few varieties of Thermarests, the only lightweight option was to buy a 3/4 length pad. I’ve had many comfy sleeps on this mattress - even though it is shorter than I am! Since my legs hang off the end, I pad the area under my legs with my backpack or with clothing. 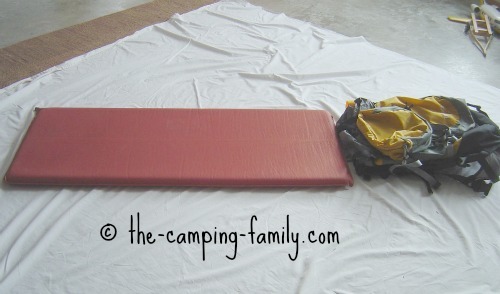 We used some wedding gift money to buy two wonderful Thermarest Base Camp sleeping pads. As you can see, a Base Camp is longer and wider than my old model. It was heavenly sleeping on a full length, wider and thicker mattress! When we had children, they slept on our little mattresses. We enjoyed our new mattresses for almost 15 years. Then my husband decided that it was time to upgrade once again. Oh my goodness! It's comfortable! Look how much thicker it is than the other models. We are thrilled with our new mattresses - and the kids are happy too, because now they sleep on the Base Camps! We still use our little original mattresses when we go backpacking. Someday, I'm going to get the Thermarest NeoAir Dream. This is the ultimate in camping comfort. It’s 4 inches thick and has a pillowtop cover! 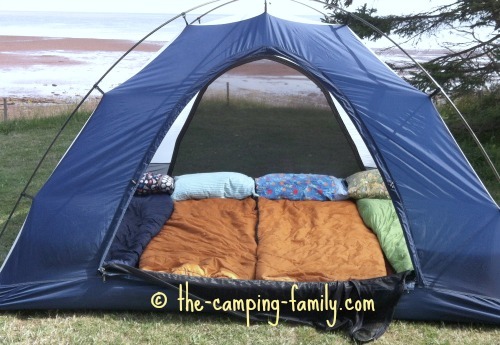 When I tried one of these in a camping store, I almost fell asleep right there on the floor! If you do lots of car camping, this would be a great investment. You could even use it as a spare bed when you have company at home. I think that a Thermarest is the very best choice for sleeping in a tent. 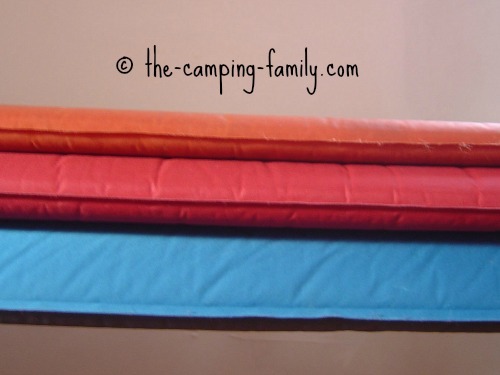 If you'd like to learn more about the other types of sleeping pads before deciding on a Thermarest air mattress, click here. Visit The Camping Family home page for lots more information about your next camping trip.